We cater–large and small orders, home or office parties. Make your next event easy and delicious! Contact us! Order ahead online for fast, hot pick-up! Busy with Easter prep? Let us do the cooking today. Take out or dine in! Meet up at Metzy’s and relax and enjoy all the fresh flavors with family and friends! There are benefits to taking the train due to Tobin Bridge construction…we call them tacos, burritos, salads & more. Save time and stop here on your way back into town for dine-in or takeout! Grab & go options, too! Feed a neighbor by adding a donation to your check or takeout order through the Our Neighbor’s Table program. 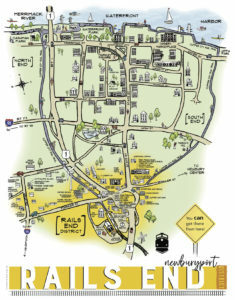 Do you know our little neck of the woods now known as Rails End District is the cool new spot in town! Come discover! Avoid the wait–reserve your table. LISTEN TO METZY’S 92.5 AD! Read about the new Metzy’s Cantina on the front page of the Boston Globe North!